After a strong start EUR/USD broke upwards to 1.1083 but was unable to sustain the momentum. A mixed set of data from the Eurozone and uncertainty hanging over approval of a bailout deal in the Greek parliament was enough to turn fragile sentiment bearish. EUR/USD initially overcame resistance at 1.1072 helped by disappointing sales figures from the US. Retail sales figures in June were surprisingly lacklustre last month leading traders to downgrade their assessment of economic activity. Sales fell by 0.3% on the prior month but more importantly came in well below the forecasted rise of 0.3%. Core retail sales (excluding the autos category) fell by 0.1% missing forecasts by 0.4%. The data came as surprise and initiated a sharp retreat on the dollar. US Treasuries moved higher. Yields on the ten year government bond fell 3 basis points to 2.41%. On the other side of the Atlantic markets were digesting a mixed set of results from the Eurozone. Germany’s closely watched ZEW is a survey of investors and business leaders. It comes in two parts – the economic sentiment index and the survey of the current situation. The current situation index improved more than expected by rising to 63.9. The forward looking economic sentiment index dropped to an eight month low. At 29.7 it showed a fall of 1.8 points on the previous month. Investors were cautious following developments in Chinese stock markets as well as the difficulties dealing with the Greek crisis. The survey showed a marked drop in sentiment on the Eurozone as well as domestically. The euro weakened against the UK pound and the Swiss franc. EUR/JPY was unchanged at 135.74 as a sluggish yen countered against bigger falls in the single currency. 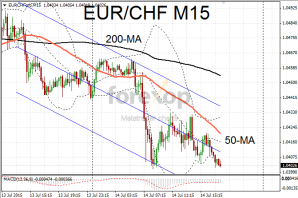 EUR/CHF dropped to a one week low despite a weaker than expected report on Swiss producer prices. 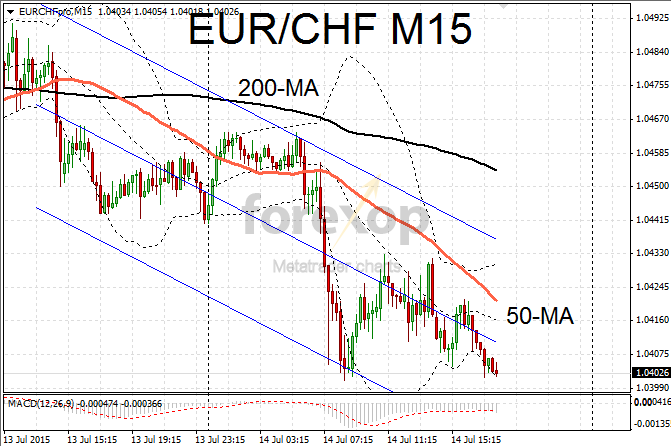 EUR/CHF fell to 1.04 as markets continue to anticipate that the stronger franc will drive disinflation in the country. Producer prices fell 0.1% in June on the previous month. The data does however show that the trend of falling prices is slowing.